Burcaw (Laughing at My Nightmare, 2014) answers the 10 most common questions kids ask about his disability, spinal muscular atrophy. When kids ask, “What’s wrong with you?” Burcaw, a white man in his 20s, replies, “Absolutely nothing is wrong with me. 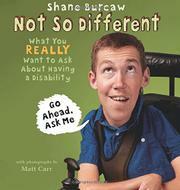 I’m just a little different!” With humor and candor, he answers questions ranging from “Why is your head so much bigger than the rest of your body?” to “How do you play with your friends?” In addition to learning about SMA, readers will discover how Burcaw gets around, plays football with friends, and eats pizza just as they might, except with the aid of a motorized wheelchair and the physical assistance of his parents and brother, who help him with “almost everything.” Though many of Burcaw’s chatty, straightforward explanations are specific to his own situation, some are more broadly applicable, such as “Please ask me before you touch [my wheelchair]!” Carr’s close-up color photographs illustrate Burcaw’s explanations by highlighting their humorous aspects—his brother dresses him in a silly outfit, a large-headed T. Rex provides a pep talk—and emphasizing his family’s closeness. Photos of family vacations and goofing around with friends remind readers that Burcaw is, indeed, “not so different” from themselves. An author’s note provides a more complex explanation of SMA as well as background on Burcaw’s nonprofit, Laughing at My Nightmare.